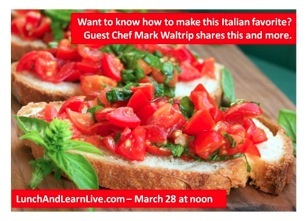 Join Chef Mark Waltrip on LunchandLearnLive.Com Thursday March 28 at Noon | Cooking Wine And Travel - The site where Foodies Unite! Posted on March 26, 2013. 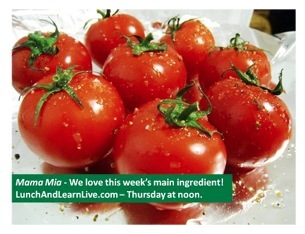 To access this webcast, simply log in to www.lunchandlearnlive.com and enter your name and password. The show starts promptly at 12 noon on March 28, 2013. We look forward to having you as our guest! Mark is a restaurateur, author, inventor and noted expert in the hospitality and real estate development industries. Mark is currently the Chief Operating Officer for Westgate Resorts and is the author of "Recipes for Success: A Cookbook with a Recipe for Life". Mark´s book is an exciting and unique concept that integrates a cookbook with a recipe for life. It is based on the idea that life is a lot like cooking - the difference between success and failure are the ingredients you chose and the recipe you follow. The book demonstrates that both successful living and cooking require essential ingredients and a clear understanding of how to bring them together to create something truly special. 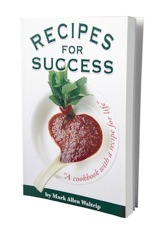 The book also includes over 100 of Mark´s recipes with simple step-by-step instructions.